In the 1980s, the American economy continued to grow, but prosperity was largely funneled to those at the top. As Joe Nocera explains, "Much of the wealth that was created in the country went to the top 20 percent of Americans. Earnings were flat for everybody else." 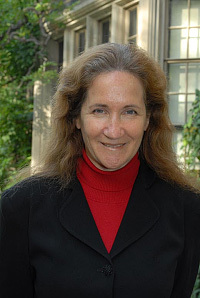 Sociologist Katherine Newman, author of Falling from Grace: Downward Mobility in the Age of Affluence, explains one reason for the growing income gap: the economy's increasing need for educated workers. Since their skills are in demand, educated workers make more money. Newman says, "That means that there's a huge scramble amongst young people to make it in through the gates of the most prestigious educational institutions because those become a ticket to professional schools, which in turn become a ticket to the upper middle class." There were other reasons for the widening income gap, including the decline of labor unions and new tax policies that benefited the nation's top earners. The rich were getting richer, but everyone's hopes for the good life kept ratcheting up. As Joe Nocera says, everyone had desires "for bigger houses, for fancier appliances, for vacations. So people began to think of investment income and debt as a way to pay for those because they couldn't afford them out of their salary." As Americans looked for more ways to fuel the lifestyle they expected, real estate emerged as a source of wealth. "You borrow to buy a home," says Chris Farrell. "And why not? A home is a real asset and over time we know real assets hold their value. So the middle class started to look at homes as an investment." In 1986 the Reagan administration pushed changes in tax law that made real estate an increasingly attractive investment. In 1996, it happened again under Clinton. Real estate became the single most tax-advantaged investment a person could make. As Farrell explains, "You get to deduct your mortgage interest, you get to deduct your state and local taxes. Now you have this incredible tax break on any gain, so more and more money flowed into real estate." 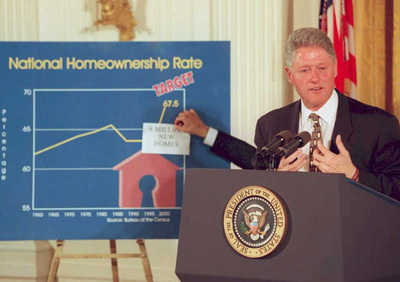 In the 1990s, the message from government was clear: owning a home would be your greatest source of wealth. Americans started to count on it. In 2000, when the dot-com bubble burst, real estate values held strong. The same was true after 9/11. Homes were the only asset that seemed sure to keep growing in value. Sociologist Claude Fischer says people leveraged their homes more and more because real estate was a stable predictor of future prosperity. "The increasing values of homes allowed many families to treat their home value, or even the potential money in their homes, as a source of wealth. It helped generate a large amount of the spending that people have been able to do in the last 10-20 years," he says. And Wall Street was only too eager to get a piece of America's latest cash cow. Global investors wanted more investment opportunities and Americans wanted more ways to increase their wealth. Wall Street gave them an arsenal of convoluted financial instruments to meet their needs. Wall Street's crash in 2008 took most Americans by surprise. So many people lost so much money in such a short period of time. The nation was once again stunned, as it had been in 1929. Stock market crashes are brutal reminders that investing in the market is a gamble. If you bet your life's savings, you just might lose it. In the "great recession" of 2009, there are constant comparisons to the Great Depression, a time when unemployment shot up to 25 percent, and once immaculately dressed businessmen were reduced to selling apples on the street. People wonder whether things will get as desperate this time. Inevitably there is consoling talk about getting back to the basics, remembering what's most important, getting rid of excess. More than anything, though, there is anxiety: What's happened to the American dream? Has the possibility of creating a better life come to an end? Following in the path of American presidents before him, Barack Obama seems to be trying to rally the nation by calling on the abiding beliefs that undergird the American dream, a set of beliefs about freedom, equality and opportunity. Following in the path of American presidents before him, Barack Obama seems to be trying to reassure the nation. He is not promising that everyone will be able to resume the same level of consumption; instead he is calling on the abiding beliefs that undergird the American dream to inspire faith in a new day. President Barack Obama's inaugural address. Obama went on to insist that America remains the most "prosperous, powerful nation" in the world. "Our challenges may be new," he said. "But those values upon which our success depends - honesty and hard work, courage and fair play, tolerance and curiosity, loyalty and patriotism - these things are old. These things are true. They have been the quiet force of progress throughout our history." In times of crisis, the idea of the American dream is remarkably strong. One reason is that faith in the power of individual action lies at the core. "The Dream assumes that one can advance confidently in the direction of one's dreams," writes Jim Cullen. I would expect that when you take a look at America 50 years from now, there will be changes. I don't know what they'll be, but they will be changes for the better. That's why we don't want to say 'throw away the American dream because of this economic crisis.' We want to hold onto it because these fundamental values have given us this terrific country we have. Nevertheless, ramping down expectations for consumption is painful. It's tough to lower one's standard of living. Will we? Does this economic crisis signal a fundamental turning point in society, the way the Great Depression did? Or will the nation soon be back to the way things were? "I think what we can hope for the American dream is that people will continue to work and earn, but we're going to move toward a society where we are more conservative with our income, and we're going to live off our income," says ARW's Chris Farrell. At the same time, he says, people may make different choices about how they use money. "There's been a rise in people spending their money on an experience, on something that enhances their life. You can see it in the rise of religion, spirituality, yoga." Ultimately, Farrell believes Americans will learn to live more within their means. "We're not going to borrow as much." Whether or not the American economy bounces back quickly, Joe Nocera argues that this recession will have a permanent impact. "The economic event of [my parent's] lifetime was the Depression, and that affected them the rest of their lives. [My] generation – the core economic event was inflation and that formed how we thought about money," he says. "I strongly believe that my children's generation will be affected by this crisis. It will shape the way they think about, and act, with their money." One prediction seems fairly safe: the American dream of freedom and opportunity will abide in the nation's psyche. The American dream of consumption will continue to evolve with changing economic times. Return to A Better Life.